The best value N-Acetyl Carnosine Eye Drops for bright clear eyes. 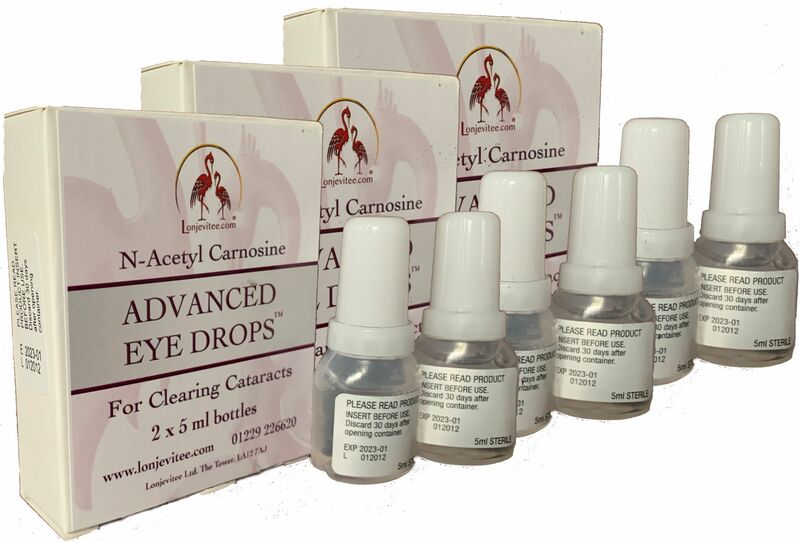 I started using Carnosine Eye Drops in 2003 following a successful operation on my right eye to remove a cataract, which had developed very quickly (within a few weeks). Being very worried, I asked the surgeon what was the likelihood of a cataract developing in my other eye, and the answer was "extremely likely". Well, having used the drops continuously in both eyes now for 11 years, there is no sign of a cataract appearing and although I now use reading glasses (age 65) my long sight is nearly perfect. Yes they are expensive but you cannot put a price on your eyesight and I am so grateful. Faultless customer service: I re-ordered yesterday on-line at midday and the package arrived in this morning's post. If you telephone you are met with the most friendly and helpful service possible. Thoroughly recommended. I've been using these eye drops for years. I have cataracts but they have never gotten worse. I only use four a day, I know I can get rid of them using more, but this works for me, as long as I can still see to live my life normally.